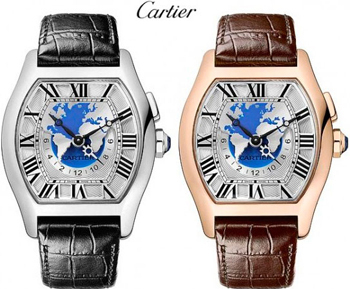 SIHH 2013: Watch Tortue Multi Time Zone from Cartier.The top line of Cartier Fine Watchmaking supplemented this year watches Tortue Multi Time Zone. Cartier has moved away from the traditional “interpretation” multifunction watches, creating a modern version with an integrated mechanism of lateral disc cities. The difference between time zones indicates retrograde dial indicator. By skilfully executed image hemispheres of the earth on multi-level dial moves the arrow indicating the day and night, providing easy readability of. New product is available in the case of white and pink gold. Presentation hours Tortue Multi Time Zone was held at the Geneva Salon International Haute Horlogerie SIHH 2013.